Until 1951 there was no commonly accepted term for people fleeing persecution. People who fled their country were known as stateless people, migrants or refugees. Different countries treated these people in different ways. Following the mass migrations caused by the Second World War (particularly in Europe) it was decided that there needed to be a common understanding of which people needed protection and how they should be protected. There were 42.5 million forcibly displaced people worldwide at the end of 2011. This figure includes 15.2 million refugees, 895,000 asylum seekers and 26.4 million internally displaced persons (IDPs). Of the global total of uprooted people, UNHCR cares for 25.9 million, including 10.4 million refugees and a15.5 million IDPs. Developing countries are host to 80%, of the refugee population. The 48 Least Developed Countries provided asylum to almost 2.3 million refugees. More than 4.7 million refugees, representing 45 per cent of the world’s refugees, resided in countries whose GDP per capital was below USD $3,000. Three-quarters of the world’s refugees resided in countries neighbouring their country of origin. 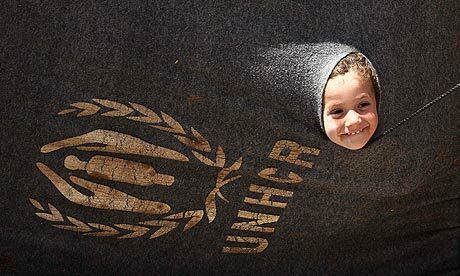 By the end of 2011 an estimated 7.1 million refugees were living in one of 26 protracted refugee situations worldwide. UNHCR defines a protracted situation as one in which 25,000 or more refugees of the same nationality have been in exile for five years or longer in any given asylum country. The three major refugee hosting countries in 2011 were: Pakistan (1.7 million), followed by Iran (887,000) and Syria (755,400; Government estimate). Pakistan hosted the largest number of refugees in relation to the size of its economy with 605 refugees per 1 USD DGP (PPP) per capita. The Democratic Republic of the Congo (399) and Kenya (321) were second and third respectively. Afghanistan is the leading country of origin of refugees in 2011 with close to 2.7 million refugees in 79 countries. On overage, one out of four refugees in teh world originated from Afghanistan with 95 per cent of them located in Pakistan and Iran. During 2011, there were more than 876,100 individual applications for asylum or refugee status submitted. South Africa received them most applications with close to 107,000 claims registered in 2011, accounting for almost one-tenth of applications globally, followed by the United States of America (76,000) and France (52,100). By the end of 2011 women and girls made up 49% of refugees and asylum seekers. They constituted half of all IDP’s and returnees (former refugees). Forty-six (46) per cent of refugees and 34 per cent of asylum seekers are children below 18 years of age. More than 17,700 asylum applications were lodged by unaccompanied or separated children in 69 countries in 2011. The applications came mostly from Afghan and Somali children.